Shakib Al Hasan has been cleared to take part in the Indian Premier League (IPL) after recovering sufficiently from a finger injury that had forced him to miss the just-concluded series against New Zealand. Bangladesh Cricket Board had earlier stated that Shakib would require medical clearance from the board to take part in the Twenty 20 tournament, where he is contracted to Sunrisers Hyderabad. BCB did not want to risk him for the last Test against New Zealand with an eye on the forthcoming ICC Cricket World Cup 2019. 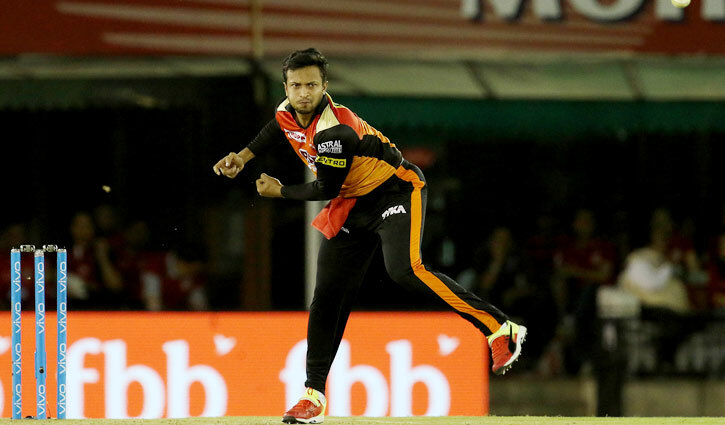 BCB cricket operations chairman has subsequently cleared the air regarding Shakib's IPL future by stating that the talisman had been given a No-Objection Certificate and that he would join SRH before the start of the tournament. "He has been practicing for more than a week and nowadays he is batting and bowling [in full scale]. He has been given that [NOC] from BCB as we knew that he will play the IPL," Akram Khan said. Bangladesh Cricket Board, however, was clearly concerned about Shakib's workload given his recent injury history and insisted that he manage it smartly through the next two months. "We will have a concern if he gets any further injury in the IPL again. "It will be better for him if he took less risk. And though we did not discuss about him in line of playing fewer matches, we will discuss with him about the risk factors before he leaves. "We will tell him not to take any [unnecessary] risks due to his fitness as well as ask him to inform the franchise that he is not available unless he is totally fit," Akram added. Shakib was expected to sit down with a BCB medical team before his departure, a meeting that had to be cancelled due to logistics issues. BCB chief physician Debashish Chowdhury however informed Cricbuzz that Shakib was on the right track to recovery. "We just wanted to sit so that we could listen to him and know how how he is feeling about himself and whether he is feeling any kind of problem while playing any particular shot or whether he is totally comfortable while doing the fielding drills because he is the best judge in this regard," he said. "As far as I know he is practicing in full rhythm and from what we have seen so far he is doing that without any kind of discomfort. If that is the case than he is surely ready to play competitive cricket," he added. Shakib was ruled out of the three-match ODI series against New Zealand and the following two Tests after sustaining a finger injury during the Bangladesh Premier League final between Dhaka Dynamites and Comilla Victorians. Shakib copped a blow from Thisara Perera while batting, and it was later revealed that he had suffered a fracture.